One of the consequences of the educational system in the United States and Europe (perhaps elsewhere too) is that, at an early age, children make decisions about whether they are good at math and science or good at the humanities. They choose a side. Commentators have harped upon the great divide for many years, from today’s debates about the importance of the STEM fields, on back to the post-Sputnik “two cultures” conversation launched by C. P. Snow, and earlier in time to Charles Babbage’s Reflections on the Decline of Science in England. There are many permutations of it in the “science wars” and “culture wars.” Those of us who research and write history for a living know that this socialization process has an enormous effect on how we tell the story of the past. After all, didn’t most historians decide long ago that they were “humanities” people rather than “science” people? Who can deny that the topics we choose reflect our values, interests, experiences, and education? Historians of science and environmental historians are among those who make forays into the process of integrating the humanities and sciences, often armed only with the knowledge that it is folly to tell the story of the past while ignoring the natural world, including biological processes in humans, animals, and plants. And yet there are many social pitfalls to uniting history and science, particularly biology. Change to organisms over time—evolution—remains a controversial subject among millions of non-scientists, particularly in the United States. Complaining about teaching evolution in schools is a time-honored tradition, as are demands to give “creation science” equal time. Occasional discomfort with “revisionist” history notwithstanding, historians have not seen their entire discipline under siege in the way that evolutionary biologists have. If historians embrace biological science and attempt to tell the story of the past—even the recent past—through that lens, is there a major storm on the horizon? Edmund Russell has thrown caution to the wind by adopting a view of history that draws unflinchingly upon the lessons of evolutionary biology. He provided a taster on this approach in a prize-winning essay in 2003 that argued for a much closer connection between historical and biological research. In Evolutionary History: Uniting History and Biology to Understand Life on Earth, he provides more than a story about deep time, which one might expect from a story about evolution. 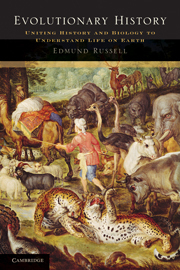 Instead, Russell employs the notion of coevolution of plants, animals, and microorganisms to explain the causes and consequences of a broad range of events. These include the activities of daily life, such as picking up dog feces and using hand sanitizer, to episodes of enormous historical import, such as the natural causes of the Industrial Revolution. Throughout, Russell wants to convince us that evolution is everywhere, happening all the time, and that humans have played an enormous role—conscious or not—in shaping evolutionary processes. He also hopes to encourage scholars to incorporate evolution into their own historical work. With such a provocative premise, I was delighted to solicit comments from four scholars, all of whom already have engaged in some way with the relationships between humans and other species in their work. Joseph E. Taylor III has written about reasons for the decline in fish populations over long periods of time, and has pointed out the futility of certain fisheries policies in keeping these populations robust and thriving. In Making Salmon, Taylor pointed out a long-standing attitude that humans could “make” salmon in a way that served human needs, finding ways to propagate them anew rather than enforcing measures of conservation or avoiding habitat destruction. Anita Guerrini also has written about human intervention in animals’ lives, but in a slightly different vein: as subjects in scientific experimentation. Many of the fundamental ideas of human biology—such as William Harvey’s seventeenth-century conception that blood circulates throughout the body—came from gruesome vivisections of animals, including dogs. Even blood transfusions from animals to humans were attempted in those years, under the short-lived premise that animals produced purer, more wholesome blood. In Guerrini’s work we can see the scientific, cultural, and moral dimensions of the interactions between humans and other species. Also concerned with the fate of animals, but on a much larger scale, is Mark V. Barrow, Jr. His Nature’s Ghosts examined those species whose evolutionary paths halted abruptly, or are at risk of doing so. Part environmental history and part history of science, Barrow’s research assesses the extinction idea itself, from the controversial fossil investigations of Georges Cuvier to the twentieth-century debates about wildlife protection. Barrow invites us to consider the causes and consequences of human-induced changes to, or even complete destruction of, other species. Julianne Lutz Warren shares with Edmund Russell a desire to see more ecology in history—and in fact she wants to see it in other domains as well. She has been critical of writers who fail to incorporate nature, and has been outspoken about the need to bring the natural world into political discourse, beyond token references to “green” politics or particular environmental issues. Also, her Aldo Leopold’s Odyssey (writing as Julianne Lutz Newton) examines the change in Leopold’s worldview from a resource-minded conservationist to an ecology-minded philosopher concerned with the role of all species. There may be a parallel here to the kind of worldview change urged by Edmund Russell among historians—to writing about the past with all living things in mind. The full roundtable, along with all the other H-Environment roundtables, can be accessed (for free) here. A direct link to this roundtable’s PDF is here. Debates about STEM can be found on numerous blogs. An example of a widely re-posted one is Cathy N. Davidson, Paula Barker Duffy, and Martha Wagner Weinberg, “Why STEM is Not Enough (and We Still Need the Humanities),” Washington Post (5 Mar 2012), http://www.washingtonpost.com/blogs/answer-sheet/post/why-stem-is-not-enough-and-we-still-need-the-humanities/2012/03/04/gIQAniScrR_blog.html. Accessed on May 10, 2012. See also C. P. Snow, The Two Cultures and A Second Look (New York: Cambridge University Press, 1963); Charles Babbage, Reflections on the Decline of Science in England, and on Some of its Causes (London: B. Fellowes, 1830). Edmund Russell, “Evolutionary History: Prospectus for a New Field,” Environmental History 8 (2003), 204-228. Joseph E. Taylor III, Making Salmon: An Environmental History of the Northwest Fisheries Crisis (Seattle: Univesity of Washington Press, 1999). Anita Guerrini, “The Ethics of Animal Experimentation in Seventeenth Century England,” Journal of the History of Ideas 50:3 (1989), 391-407. See also Anita Guerrini, Experimenting with Humans and Animals: From Galen to Animal Rights (Baltimore: Johns Hopkins University Press, 2003). Mark V. Barrow, Jr., Nature’s Ghosts: Confronting Extinction from the Age of Jefferson to the Age of Ecology (Chicago: University of Chicago Press, 2009). Julianne Lutz Newton, Eric T. Freyfogle, and William C. Sullivan, “Land, Ecology, and Democracy: A Twenty-first Century View,” Politics and the Life Sciences 25:1/2 (2006), 42-56. Julianne Lutz Newton, Aldo Leopold’s Odyssey: Rediscovering the Author of A Sand County Almanac (New York: Island Press, 2006).